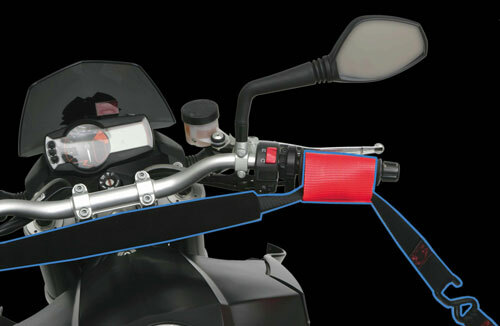 The Original Bar Harness was invented in 1993 to solve the problem of where to attach tie-downs to a motorcycle covered in plastic bodywork. It is made entirely of Polyester webbing and sewn with polyester thread, using our own stitch pattern, on cnc programmable sewing machines. The Original Bar Harness became a must-have for most people transporting motorcycles. Until the invention of the Bar Harness II, it was, and in many cases, still is the safest and easiest way to secure a motorcycle for transport. The 33105 Red Original Bar Harness fits bars up to 28 inches wide. The 33202 Blue Original Bar Harness fits bars up to 28 inches wide. The 33505 Black Original Bar Harness fits bars up to 28 inches wide. The 37105 Red Original Bar Harness fits bars up to 32 inches wide. The 37205 Blue Original Bar Harness fits bars up to 32 inches wide. The 37505 Black Original Bar Harness fits bars up to 32 inches wide. The 39105 Red Original Bar Harness fits bars up to 34 inches wide. The 39205 Blue Original Bar Harness fits bars up to 34 inches wide. The 39505 Black Original Bar Harness fits bars up to 34 inches wide. If you need something narrower or wider, give us a call! NOTE: We are a little generous with our webbing so all of our sizes typically fit bar a little wider (1 to 1.5 inches) than shown here. Load the motorcycle onto trailer or into truck, placing front wheel against a secure stop (such as the truck cab). A helper or “spotter” is highlyrecommended. Lower the side stand or have someone steady the motorcycle until it is secured. Grasp one cuff in each hand and pull apart far enough to slip first one cuff, then the other, over the handlebar grips. Be sure the cuffs are all the way on, up to, but not over any switch gear. You will notice it is necessary to rotate either cuff 180 degrees toward the front or rear so that the cross straps hang from the bottom of the cuffs. This will cause a twist in the cross straps, which is normal. Next, pull out on the ends of the straps until they are snug and the cuffs are all the way on the grips. The hooks at the other end of your tie-downs should be secured in position to triangulate the support of the motorcycle. Additional tie-downs are highly recommended and should be attached nearer the rear of the motorcycle (possibly to exposed frame tubes or grab handles). The ideal situation is to tie the weight of the motorcycle downward so as to take the weight of the motorcycle out of the equation, then all the Bar-Harness has to do is keep the bike upright, causing less stress on motorcycle components. This warning is for your protection! Don’t ignore it and blame it on the harness. NEVER install harness on loose bars. NEVER install harness on handlebars higher than four inches above the top triple clamp or handlebar clamp. NEVER compress the front forks more than half way, or approximately two to three inches. NEVER pull down on the straps hard enough to bend your handlebars. NEVER install harness on motorcycles with extended forks (such as choppers).